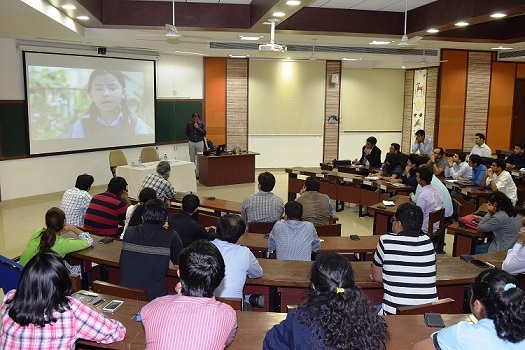 IIM Indore’s EPGP Corporate Interaction Committee organized a guest talk by Mr. Arhan Bezbora, Director- National Alumni Impact, Teach For India on November 30, 2016. Mr. Bezbora gave an interesting talk on the topic –‘Leadership for Social Change’, wherein he discussed about his professional journey with Teach For India and his understanding of education. 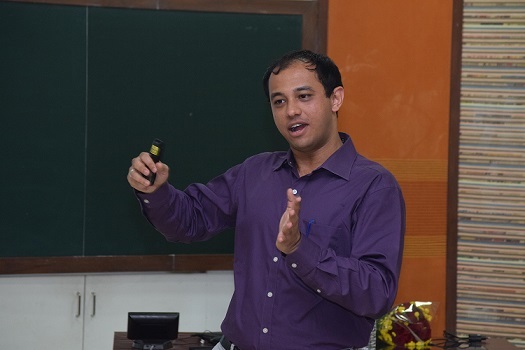 He began his talk discussing about Teach For India and its initiatives. He also discussed about the various other important factors like ability to overcome the barriers which arise during a child’s education, the important role played by moral values and the kind of exposure a child gets during education. ‘The amount of exposure a three year old kid used to get 10 years ago was so much less than what a three year old child gets today. There is a huge gap and education has changed tremendously’, he said. Discussing about India’s education crisis, Mr. Bezbora noted that 52 percent of fifth-grade students can’t read the text of a second-grade book. 32 percent of second-grade students are not even able to recognize the numbers. 97 percent graduates today aren’t able to pass the central teacher eligibility test. 90 percent of students across the nation don’t make it to the college. 45 percent students aren’t enrolled in the secondary school and 45 percent schools don’t have usable girl’s toilet as well. ‘So many issues and the underlying problem is lack of leadership here. People don’t wish to work as teachers—only those work as teachers now a days who didn’t get any other opportunity—is the common mentality now’, Mr. Bezbora said. Today, India needs to work towards a vision where a group of leaders work together to provide education to every child in the country and are able to eliminate education inequality. The youngsters need to come together, reimagine the problems and find solutions—try working in a proper ecosystem which is sustainable, and be able to look at multiple perspectives at a single time and manage them efficiently, said Mr. Bezbora. ‘The child lives among his parents, school, neighborhood, and other organizations which may be NGO, governmental organizations, private institutions etc. These organizations today are just focusing on how they can create their own impact in education rather than focusing on what kind of education a child needs. All these links need to be interconnected and work together for a bright future’, mentioned Mr. Bezbora. He concluded his talk quoting—‘Transforming systems is ultimately about transforming relationships among people who shape these systems.’ The talk was followed by a Q&A. Professor S.K. Ghosh gave the closing remarks. About Mr. Arhan Bezbora: Mr. Bezbora currently leads the Alumni Impact Team at Teach For India whose mission is to empower its 1500-strong, and growing alumni network to build a movement for educational equity in the country. 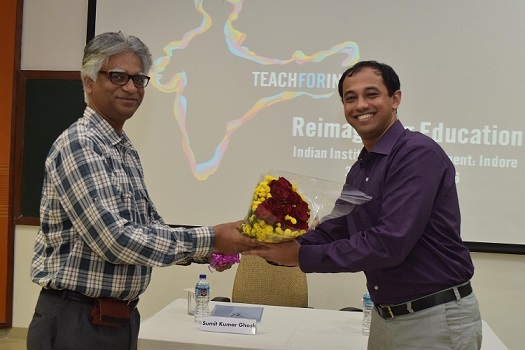 At Teach For India, Mr. Bezbora is leading efforts to evolve the organization’s long-term strategy and develop innovative programs in the areas of educational leadership, social innovation, and collective action.